For the third time in his storied career Alexander Gustafsson fell short in his bid to capture the UFC light heavyweight title at UFC 235. “The Mauler” suffered a third-round knockout loss to division kingpin Jon Jones last weekend in Los Angeles, marking the second time in his career that the Swede had fallen victim to “Bones”. The pair had first met at UFC 165 in Toronto, with Jon Jones being awarded a decision victory after a twenty-five minute fight of the year contest. 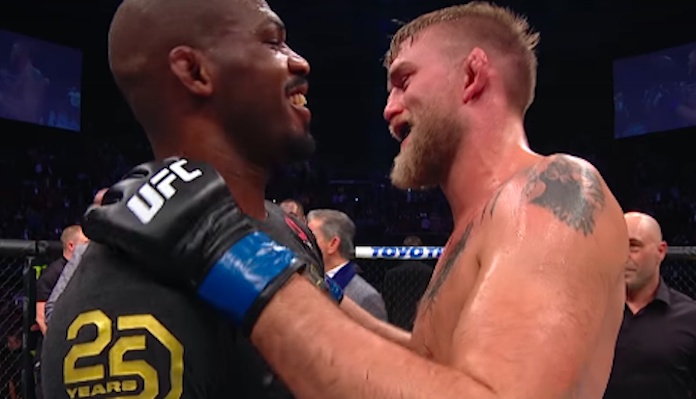 In their most recent scrap at UFC 232, Jon Jones looked seemingly unbeatable and eventually put Gustafsson away with ground and pound in round three. Now over a week removed from the devastating setback, Alexander Gustafsson (18-5 MMA) has taken to Instagram where he issued the following statement on his second career setback to Jon Jones. “I just wanna give my fans massive gratitude for giving me so much support and love before and after the fight ❤️ thanks! Gustafsson recently mentioned a possible move to the promotions heavyweight division for his next octagon appearance. However, nothing has been made official as of this time. Prior to his knockout loss to Jon Jones at UFC 232, Alexander Gustafsson had scored back-to-back victories over Jan Błachowicz and Glover Teixeira. As for Jon Jones, the newly crowned UFC light heavyweight champion will return to the octagon at March’s UFC 235 event where he will defend his title against surging division contender Anthony Smith. Who would you like to see Alexander Gustafsson fight in his next octagon appearance? Sound off in the comments section PENN Nation!